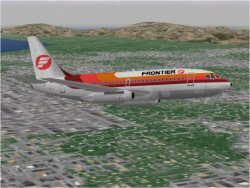 747 was a flight sim created for the Atom computer, running in _12K of RAM_. To give you an idea, 12k is about the size of a small web page these days. Or a few pages of text. Adds the Cessna 421C Golden Eagle to Microsoft Flight Simulator 2002. 727-100/200 in one of four versions with a total of 29 different liveries. Microsoft Flight Sim 2004, Flight Sim X. 200, 300 and freighter variants with an impressive selection of different airline liveries and different engine variants for MSFS 2004 and FSX. Acro Jet was released in 1985 on the Sinclair Spectrum. Adds aircraft, scenery and ANIMALS to Microsoft Flight Simulator 98. It took aircraft from Microsoft Flight Simulator 98 and added moving parts such as landing gear and propellor blades. "Enjoy a career as a virtual cargo pilot - feel the pressure as you fight bad weather, with the Black Box watching your every move." - pub info. Real aircraft: Bell X-1, Cessna 172, Douglas X-3 Stiletto, General Dynamics F-16 Fighting Falcon, Lockheed SR-71 Blackbird, McDonnell Douglas F/A-18 Hornet, North American P-51 Mustang, Piper PA-28 Cherokee, Sopwith Camel, SPAD S.XIII, Supermarine Spitfire. Experimental aircraft: Grace Industries XPG-12 Samurai, Hilleman Ltd. XRH4 MadDog, Lerner Aeronautics XNL-16 Instigator. Turboprops: Lockheed L-188 Electra, Lockheed P-3 Orion, Convair 580 | Twin Propliners: Convair 240, 340, 440 series | Classic Twin Propliners - Douglas DC-3, Dakota C-47 | Jet Airliner: Boeing 757 | Jet Trainer: Aermachhi MB339 | Basic Trainer: DHC-1 Chipmunk | Transport: L-100 and C-130. The AA radar allows real intercepts to be made, commonplace in combat sims but a first for Microsoft Flight Simulator 2004. Comparison of aircraft and scenery in Microsoft Flight Simulator 98 and Microsoft Flight Simulator 2002. I took up all the flyable aircraft in the standard release of the sim, and where possible, flew them in the same locations, enabling a quick look at how far the graphics had advanced in 5 years.